In addition to having the highest quality parts, you need to have an integrated system to create a lighting portrait. There are three main problems that can ruin a great lighting portrait; poor light output, wicking and corrosion at the point of connection. For this reason Unique developed the Equalizer™ HUB Wiring System. Using the Multi-Matic Power Transformer, the Equalizer™ HUB Wiring System, and our top of the line fixtures, Unique has created the only system that produces even lighting output at every fixture and allows for relocation of fixtures at any time. The HUB System ensures proper voltage distribution and can be used with one or more fixtures. Unique Lighting™ fixtures come with a 25-foot wire lead that taps into the Hub creating a simple, and maintenance-free lighting system! The Satellite™ HUB is the ultimate In-Line fuse protected wiring system and the future of Landscape Lighting Wiring. 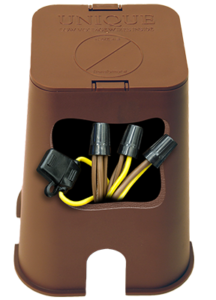 Unique includes a replaceable 20 and 10 amp fuse at the point of connection allowing you to size the fuse according to load or wire size, thus making troubleshooting accessible, convenient and fast. The Satellite HUB includes three barrel lugs with lithium greased caps and a In-Line 20 amp fuse. The dark brown housing blends discreetly for above or below ground installation.